ALISA CRUISE, The Princess of the Ocean – Expect More Than A Cruise! From our beginnings as a single story over one year ago, ALISA CRUISE set out to be a different kind of other cruises. One that not only celebrated cruise with the rich services but that also brought a feeling of connection among people. In every place that we’ve been and every place that we touch, the luxury ALISA CRUISE tried to make a better than ever! 07:30 – 08:20: Pick up at your hotels in Hanoi old quarter upon your requirement. 10:00 – 10:20: Stopover at Hai Duong province for refreshment about 20 – 30 minutes. 12:30: Welcome to Alisa Cruise, enjoy a welcome drink while our cruise manager gives a brief introduction, safety guidelines bout Alisa Cruise. 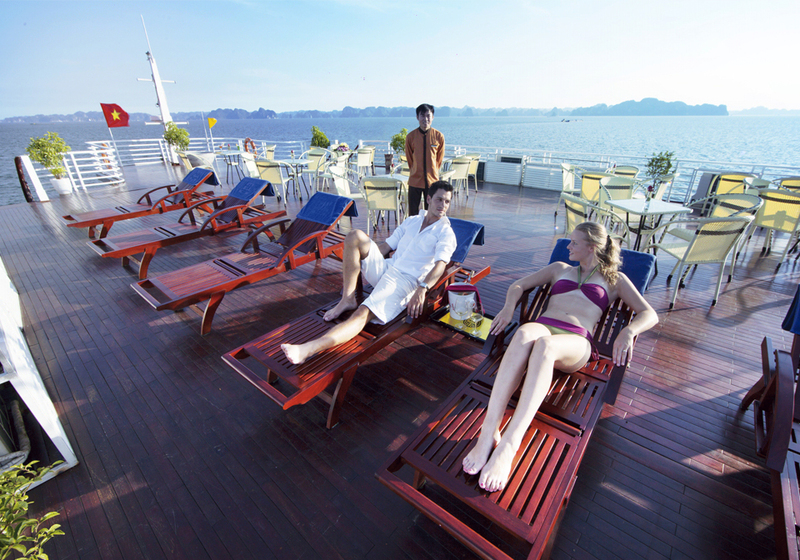 Check-in your cabin and start cruising and explore Halong Bay – one of the New Seven Wonders of Nature. 12:40 – 14:00: Enjoy lunch with Vietnamese and International dishes served while cruising in the magnificent Halong Bay, admiring the fascinating rock formations in the bay. 14:30: Arrival in Lan Ha Bay in Tung Gau Area- The most beautiful area in Halong Bay with wild natural beauty. Customers will have 45 minutes for kayaking around the Pearl Farm Village Area. 16:00: Visiting the beautiful Titop beach for swimming (if the weather permits), Titop beach is especially famous for its fresh atmosphere, clean water, and smooth white sand that create a great ambiance for tourists to relax or passengers can take steps to reach the top of Titop beach to have a whole panorama view of Halong Bay. 16:00 Visiting Halong Pearl Farm Village. Travelers will have a chance to visit Floating Pearl Farm and see how local people produce great pearls. This Pearl Farm Village was established in 1995 by a Japanese organization, after years run by Japanese experts, it was transferred for Vietnamese. Our guide will show you around the farm and the museum there and explained how the process is done. You will pass a floating raft where some kinds of oyster pearls are grown and transplanted such as South Sea pearl, Tahitian Black Pearl, etc. After that, you will see a processing room where workers transplanting oysters and understand some precious species of pearl. The last, you could see one of the workers here opening an alive oyster in front of your eyes to see pearl inside and then have to look their achievement in the showroom! 17:30: Come back to our Alisa Cruise and relax by enjoying Sun Set party with Juices, Cocktails, Red Vine and fruits on Alisa Sky Bar. 18:00 – 18:30: Join the cooking class guided directly by Chef of Alisa Cruise on sundeck. Our Chef will guides how to make Vietnamese spring rolls – traditional Vietnamese food. Then enjoy Happy Hour (Buy 2 drinks get one free). It is time for chit chat and relaxes. Watch the magnificent sunset over Halong Bay. 19:30: Time for dinner enjoying special food on the cruise at Alisa Restaurant. 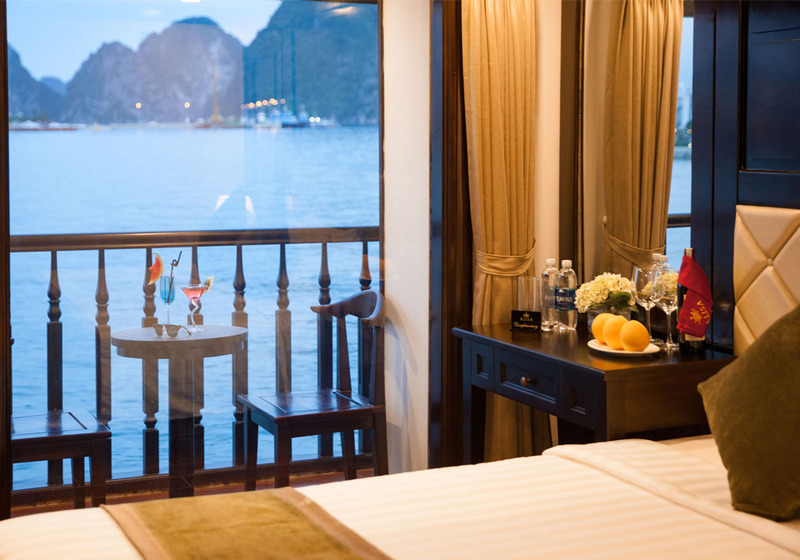 Evening activities include: Leisure time to enjoy a chat around the bar, watching movies and many sorts of Vietnam cultural films, relaxing and spending a romantic night on Alisa Cruise’s music, playing cards, chess are available, reading magazines in room and dining room. You may also try your luck at squid fishing & fishing from the boat. 23:00: End of Program for Day One. 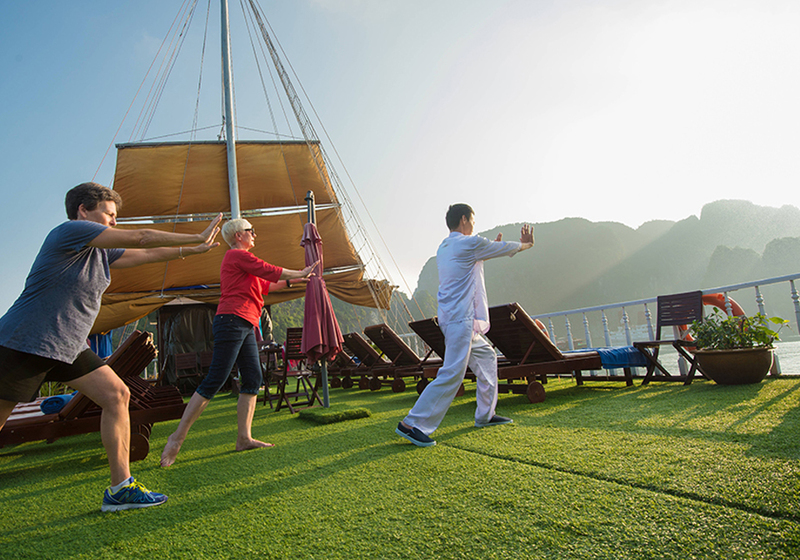 06:30: Early morning sun risers can enjoy Tai Chi Le session on the sundeck. Tai chi also called Tai chi chuan, combines deep breathing and relaxation with slow and gentle movements. Coffee, tea, and pastries for light breakfast are served in the dining room with the morning view of bay’s landscape. 07:00: Morning view of bay’s landscape with a cup of tea or coffee and breakfast. 08:00: Transfer by tender to Sung Sot Cave. Walk up about 100 steps to the cave entrance. It takes approximately 45 minutes for cave visiting. Visit Sung Sot Cave, one of the biggest cave in Halong bay with beautiful stalactites and stalagmites. Return to the boat by tender. Proper shoes are highly recommended. 10:00: Check-out of your room and settle bills at reception. 151:0 – 16:00: Visiting Luon cave, the perfect combination of limestone mountains and jade-green sea by bamboo boat with local people. Enjoy quiet space and pure air, you will feel relaxed truly. If you are lucky, you will see monkeys on islands. 16:00: Visiting Halong Pearl Farm Village. Travelers will have a chance to visit Floating Pearl Farm and see how local people produce the great pearls. This Pearl Farm Village was established in 1995 by a Japanese organization, after years run by Japanese experts, it was transferred for Vietnamese. Our guide will show you around the farm and the museum there and explained how the process is done. You will pass a floating raft where some kinds of oyster pearls are grown and transplanted such as South Sea pearl, Tahitian Black Pearl, etc. After that, you will see a processing room where workers transplanting oysters and understand some precious species of pearl. The last, you could see one of the workers here opening an alive oyster in front of your eyes to see pearl inside and then have to look their achievement in the showroom! 18:00 – 18:30: Join the cooking class guided directly by Chef of Alisa Cruise on the sundeck. Our Chef will guides how to make Vietnamese spring rolls – traditional Vietnamese food. Then enjoy Happy Hour (Buy 2 drinks get one free). It is time for chit chat and relaxes. Watch the magnificent sunset over Halong Bay. 06:30 Early morning sun risers can enjoy Tai Chi le session on the sundeck. Tai chi also called Tai chi chuan, combines deep breathing and relaxation with slow and gentle movements. Coffee, tea, and pastries for breakfast are served in the dining room with a morning view of bay’s landscape. 08:30 – 10:00: Transfer to Alisa Day Boat for Exploring Luon Cave where you can enjoy KAYAKING or rowing BAMBOO BOATS with local people or by yourself. 10:30: Continue cruising and passing through the Stone Dog Island. This Island is another fascinatingly shaped limestone rock in the bay. 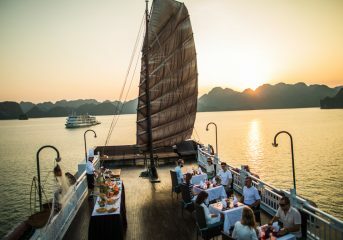 19:30: Under the magnificent night sky, in the magic atmosphere in Ha long Bay, Our luxury set-menu dinner is served with a variety of Vietnamese and Asian foods. 17:30: Come back to our Alisa Cruise and relax by enjoying Sun Set party with Juices, Cocktails, Red Vine and fruits on Alisa Sky Bar. (Buy 2 drinks get one free). 18:00 – 18:30: Join the cooking class guided directly by Chef of Alisa Cruise. You have a chance to practice Vietnamese traditional dishes such as spring roll or famous cuisine of Vietnam. Join the squid fishing on the boat with our crews. You can enjoy the squid cooked with assistance from our chef. 22:00: Overnight on Alisa Cruise near Surprising Cave, the quietest sleeping area permitted by Halong Governmental Authority. Enjoy an unforgettable fine dining experience with your loved ones. Sample delicious Vietnamese cuisine prepared by expert chefs and receive excellent, attentive service.